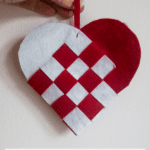 And if that isn’t enough, I also think that these white clay hearts make BEAUTIFUL Christmas Ornament DIYs!! Don’t you think? Simply stunning! 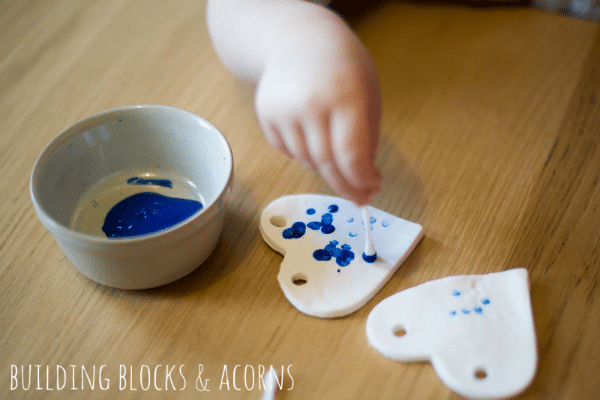 These beautiful White Clay Hearts are also included in our practical, easy to download and print out Christmas Ornament Book. 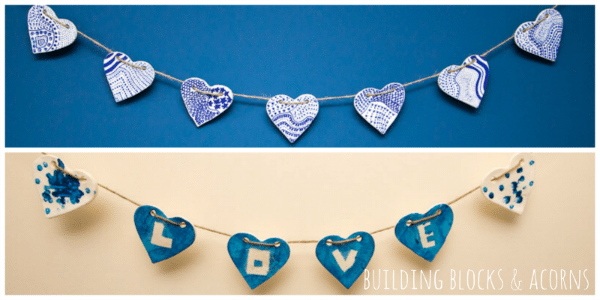 Each craft is shared on one page – making the perfect worksheet print outs. Lovely to have them all in one place too! 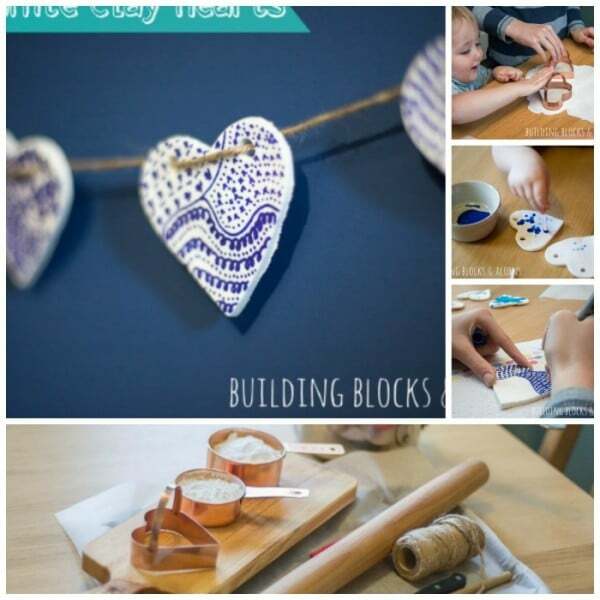 Welcome o Louise from Building Blocks and Acorns with her beautiful DIY White Clay Heart Garland! It’s wonderful to be a part of the 31 days of love series! 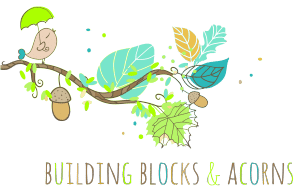 I’m Louise and I write over at Building Blocks and Acorns, where I share activities to promote fun and learning for my little boy (on my days off as a Primary teacher and nursery worker!) A lot of what I do has a sensory and nature focus, too. Put the three ingredients into a pan on a medium heat. Remove from the pan once the mixture has come together to make a sticky play dough consistency, and leave it to cool. After around 10 minutes, once the clay has cooled enough to be handled safely, roll it out to approx. 5mm thick. Use the heart shaped cutters and carefully place them on the lined baking tray. Trim off any ragged edges with a knife. Make the threading holes using a straw. Bake for approx. 40 minutes, turn the decorations over and pop them back in the oven for a further 10-15 minutes to dry them out. Leave to cool… then, get decorating! I enlisted the help of my two nephews (9 and 12) and got them to do some sneaky handwriting practise by repeating patterns along two curved lines using a blue sharpie pen. It’s that simple! I gave them paper to try their ideas out on first and then they draw their designs straight onto the white clay using the sharpies. I’ve never seen them so quiet! I love how it looks like porcelain when it’s all complete and looks really effective! Sharpie pens and toddlers don’t mix… trust me, I discovered the hard way! 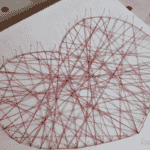 So for smaller fingers, try using letters made using masking tape before letting them loose with some poster paint for some ‘relief art.’ My little boy used cotton buds (also known as q-tips,) to create a spotty effect for two of the hearts. 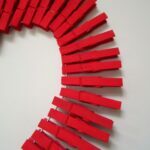 It’s a great way of getting little ones to rehearse their pencil grip and fine-motor skills. We were delighted with the finished products! I hope you enjoy trying these out, too! Get your Christmas Ornament Book today! This is so cute! I have never made white clay before so saved this for future reference. Love how you have adapted the decorating for younger children too!! Agreed, Louise did a wonderful job! *blushes* thanks! My nephews were really excited when they saw the results. I love how it looks a little like porcelain with the blue on it. What temp.do you bake them at? 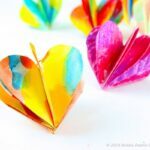 This looks beautiful and I totally love the idea for little ones. Mine went brown? What happened? I dropped the temp to 100 degrees because my oven is fan forced. And they didn’t dry out properly. Tanja, we baked on baking paper at 110C fan forced for 30 mins. I needed the oven to cook dinner so took them out early (planned to put them back in later, but never did). Ours were white on the top side and a little brown on the underside where they didn’t quite dry out/cook completely. Maybe this happened to you? 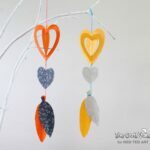 My girls love them-we made hearts and dragonflies, and decorated with sharpies and regular textas. This is so cute. Would this clay be able to make little beads to string through yarn for a bracelet without breaking? Can you seal these -maybe with modgpodge? That would be a good thing to try! I think these are so cute! 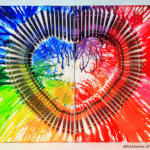 May I offer a suggestion as a Special Education teacher who uses art as therapy (and fun!) with my students? 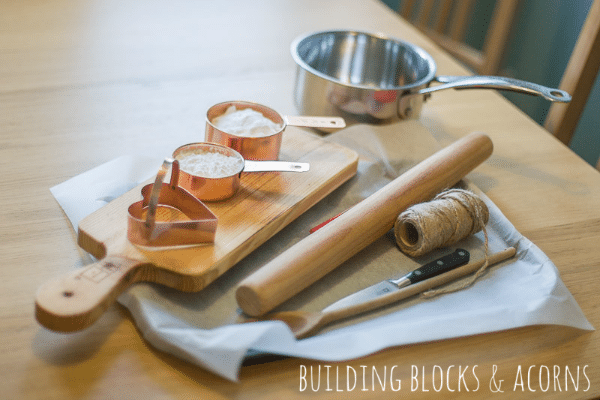 It is so much easier not to have to make the clay, especially if there’s a stove involved. We use th stove for cooking, but that’s a whole different set of skills. Crayola makes Model Magic, an air-dry clay that is soft to the touch, pliable and not tacky or sticky at all. For my kids, who are often sensory overloaded and can’t touch anything sticky or gooey, Model Magic is a God send. 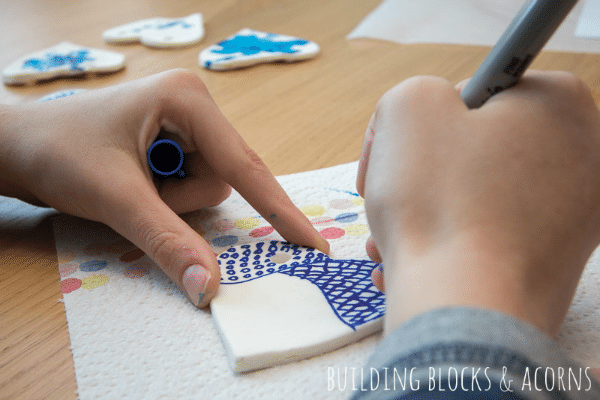 We can use markers, tempera, push beads into it, use cookie cutters, and then let it air dry and you have a beautiful ornament that lasts for years. They still feel soft, but aren’t as pliable. I keep a huge tub of white Model Magic in my cabinet all the time, and can pull it out at a moment’s notice, when I need a Plan B Lesson, (happens like that in Special Ed., lol…) or a quick art project if we ar quickly finished with our day’s work and have a spare half hour. 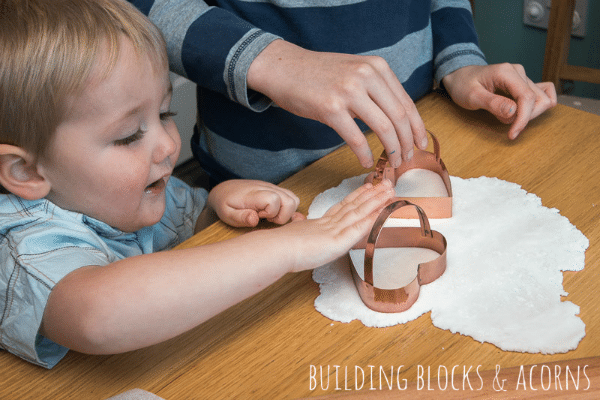 The therapeutic aspect is amazing from the fine motor skills, to the calming nature of rolling the soft clay into something familiar while nice music plays. My students are also blind, so feeling this with their hands and its calming qualities has a lot of values. I love what you did with the banner! I might steal this idea for a wall decoration in my classroom! Can the decoration be done at a later stage,like the next day or would they have dried up too much? 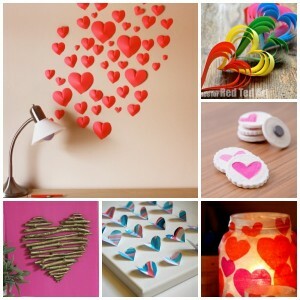 You can decorate the next day, yes!